The CandlestickSeries is similar to the OhlcSeries, but instead of tick marks, it uses a rectangle which horizontal sides define the opening and closing price. The rectangle is filled if the opening price is lower than closing one, otherwise it's empty. CandlestickSeries class inherits from the OhlcSeriesBase class - See the inherited properties. 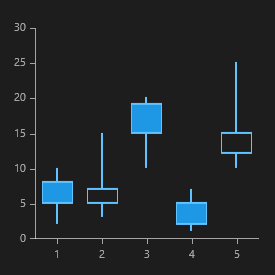 Here's an example how to create RadCartesianChartwith CandleStickSeries. Finally, we are ready to create the chart using XAML.